Hi Guys! Hope you are doing well. Welcome you onboard. Today, I’ll unlock the detailed Introduction to 74LS00. It is a logic gate IC that comes with four independent NAND Gate functions with each gate containing two inputs, therefore it is also known as Quad 2-Input NAND Gate. Logic gates come handy in computational applications. Most of the recent cell phones and laptop devices incorporate logic gates that play a vital role in the decision-making process. Some common applications include multiplexers, encoders, decoders, arithmetic logic units, processors, MP3, and Blu-ray players. In this post, I’ll discuss major details of 74LS00 i.e. its main features, working, pinout and applications. Let’s jump right in. 74LS00 is a logic gate IC containing four independent NAND Gate functions where each gate on the IC comes with two inputs. The NAND gate is a combination of AND and NOT gate, ultimately producing the output that is exactly opposite to the AND gate. Before we move any further, we must know what is a Logic Gate? It is a physical device that performs boolean functions using single or combination of inputs and produces the single output. The generated output will represent only one of the two values: HIGH or LOW where HIGH means the circuit is working and producing the required output and LOW means the system will generate no value. Previously RTL (resistor-transistor logic) gates were employed in integrated circuits for carrying out simple functions. Later on, the resistor in the RTL gate was replaced by a diode, producing DTL logic gates that proved to be an ideal choice for both better density and high-speed applications. Some microprocessors come with very complex functions, requiring more than 100 million gates inside the system. 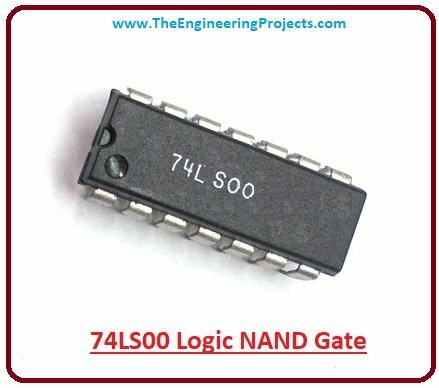 Let’s get to the nitty-gritty of the logic NAND gate 74LS00 we are discussing right now. 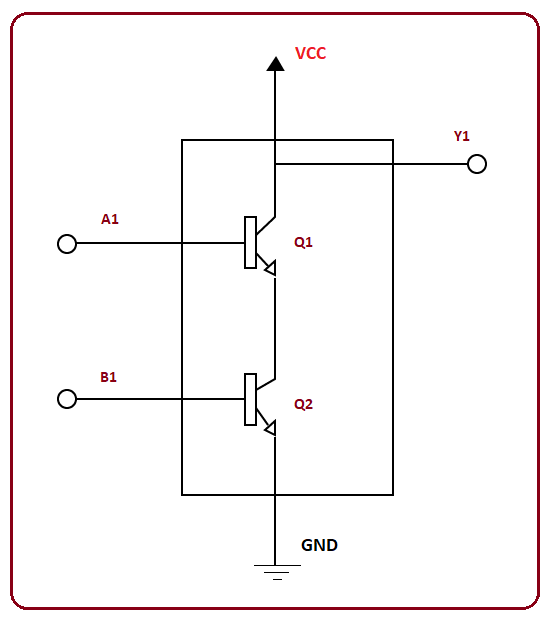 This IC operates in a voltage ranging from 4.75 to 5.25 V with free air operating temperature ranging from 0 to 70 ºC. There are four gates with each gate capable to draw 8mA output current. The IC is highly economical and is readily available in the market. It features less transition time that makes it an ideal choice for high-frequency applications. Following figure shows the pinout diagram of 74LS00. 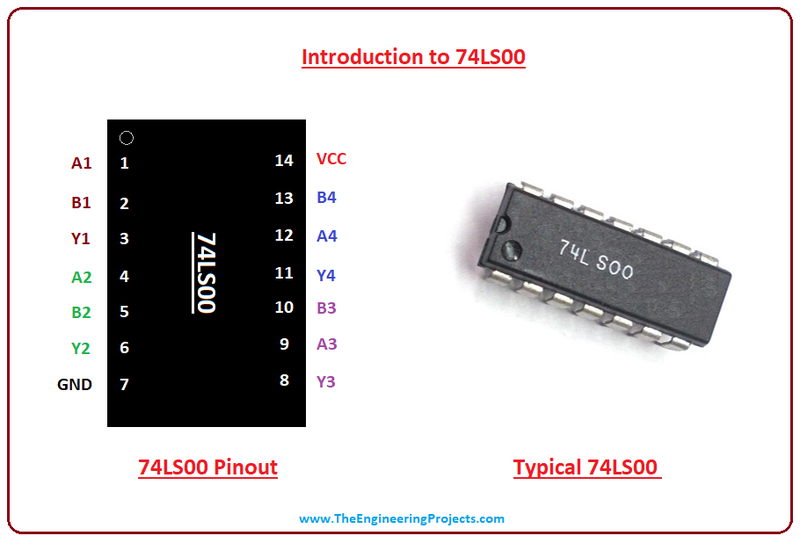 The pinout is self-explanatory. There are total eight inputs and fours outputs with pins 7 and 14 used for ground and voltage supply respectively. 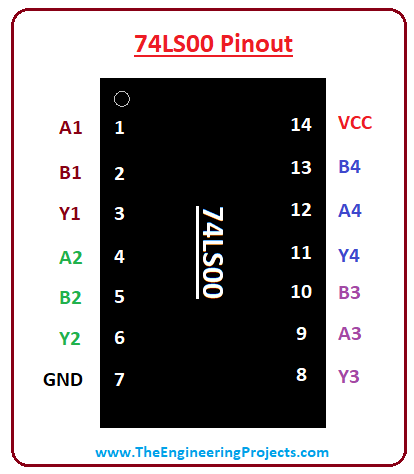 Following figure shows the pin configuration of the 74LS00 NAND gate. 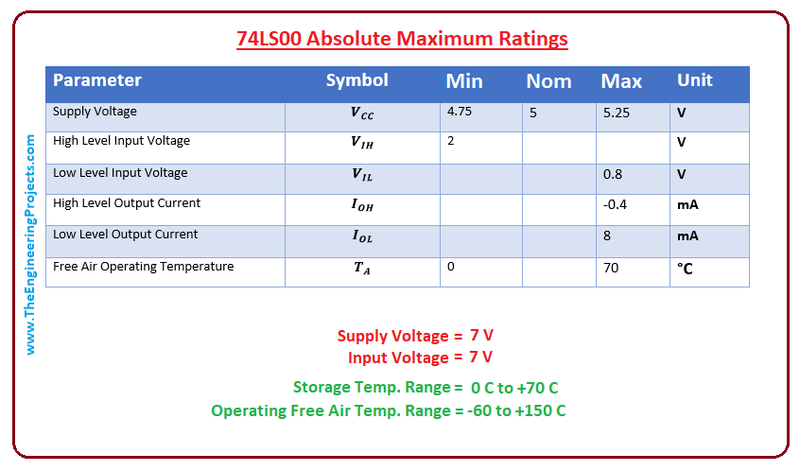 Following figure shows the absolute maximum ratings of 74LS00. These are the stress ratings. If ratings are exceeded from these stress ratings, they can severely affect the device quality. Similarly, if stresses are applied for an extended period of time, they can badly influence the device reliability. The working is very simple, aiming to produce output based on the inputs provided. 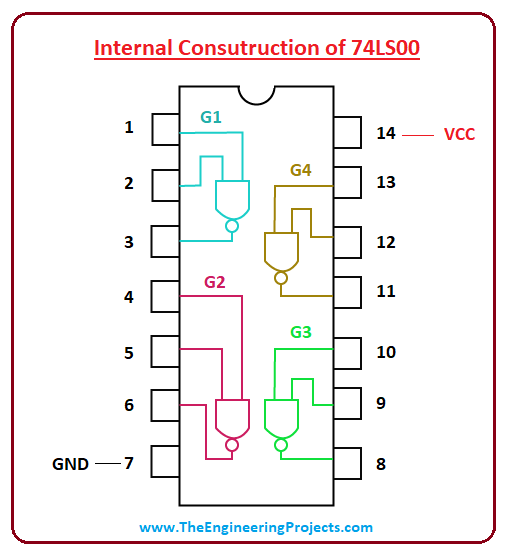 The following figure shows the internal construction of this NAND gate IC. 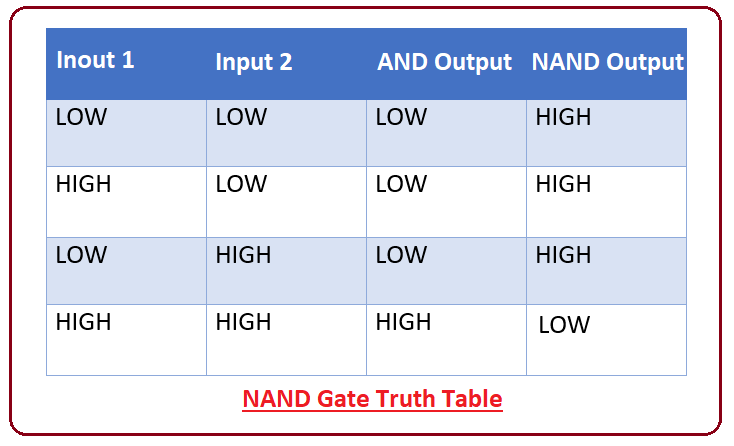 The Truth Table of NAND Gate is given as follows. You can see from the table above, the output of the NAND gate is inverse of AND gate. Let’s get down to the internal circuitry of the NAND gate and study the Output with a different combination of inputs. In case 1, we will be considering both inputs A1 and B1 are LOW. As inputs are LOW, the corresponding transistors Q1 and Q2 will appear OFF on the circuit. Consequently, the total supply voltage will show up on both transistors, resulting in keeping the output Y1 at a HIGH level. In the second case, only one of the two inputs will be HIGH. The input that appears HIGH will help in turning on the corresponding transistor while other with no input will remain OFF. In this case, the Y1 output again will appear as HIGH as one of the inputs is OFF, fetching all voltage appearing across the transistors. In this case, both inputs are kept HIGH. Now, both transistors will remain turned ON, resulting in no voltage appearing across them. As mentioned earlier, Y1 is the output voltage across both transistors, so Y1 will be appearing LOW in this case because of no voltage on both transistors. 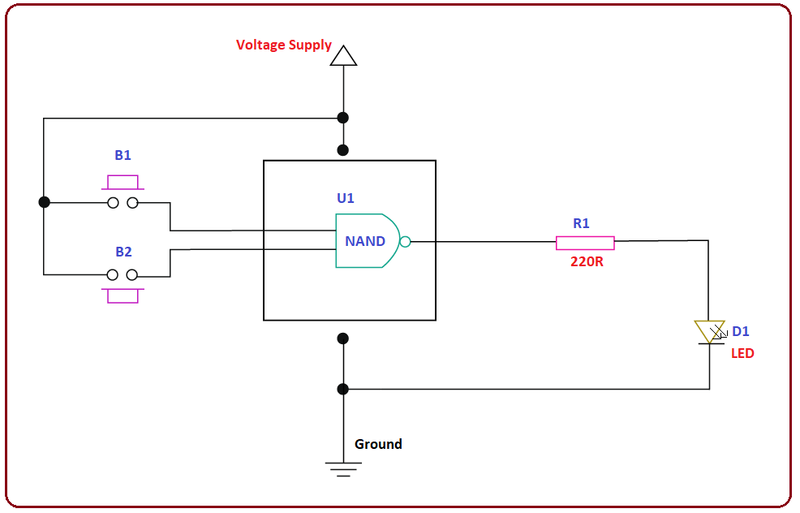 We can further elaborate the functioning of NAND gate by simple application. We will be connecting two inputs on the NAND gate and its output is connected to LED through a resistor. The output of the NAND will appear directly proportional to the ON and OFF status of LED connected at the end. When both inputs are HIGH, the NAND output will show LOW status at the LED i.e. it will remain turned off as there will be no voltage sinking across the transistors. And when one of the inputs is HIGH, the output will be HIGH as per the voltage appearing across another transistor with LOW input status, similarly when both inputs are LOW, again the output will be HIGH, resulting in turning on the LED. That’s all for today. I hope I have given you everything you needed to know about this NAND gate. However, if you are unsure and consider something is left unsaid, making it difficult for you to grab the basic idea, you can approach me in the comment section below. I’d love to help you the best way I can. Your feedback and suggestions are a real asset for us based on which we strive to create quality content, so keep them coming. Thanks for reading the article.